Mike Shadrack is President of the Western New York Hosta Society and has been a member of The American Hosta Society since 1992 and has served on the Board for eight years. He has also been a member of the British Hosta and Hemerocallis Society for twenty two years, is former Chairman and currently their executive Bulletin Editor. In addition, Mike is a member of the Buffalo and Erie County Botanical Gardens Inc. Board and chairman of their Plant Collection Committee. He further serves on the Board of Garden Walk Buffalo Niagara and is chairman of their Events Committee. In 1996, Mike retired from London's Metropolitan Police after thirty two years service and has rarely sat down since. As a police officer he served in many parts of London including Soho (the seediest part of the West End), Whitechapel (the seediest part of the East End), and at Scotland Yard where he was responsible for Public Order and Ceremonial planning. Mike is a qualified London Tourist Board Guide and has organized garden tours both in England and specialized hosta tours in the US. Another hobby, photography, has led to a library of about 8,000 images of hosta varieties and hosta gardens, many of which have been published in UK and USA catalogues and magazines. In addition, he supplied the illustrations for the Royal Horticultural Society, Wisley handbook 'Hostas'. He is co-author with Diana Grenfell and photographer of the book, The Color Encyclopedia of Hostas, (ISBN 0-88192-618-3) released by Timber Press in April, 2004. The book was named the '2005 Reference Book of the Year' by The British Garden Writers Guild. The sequel to that book – Timber Press Pocket Guide to Hostas - was released in September, 2007. Both these early books are now out of print. In addition, a French hosta book, Les Hostas was published in early 2007 with Mike as photographer and co-author. In February 2010 Timber Press published a new edition of Mike and Diana's The New Encyclopedia of Hostas with updated descriptions and photographs of new cultivars. Kathy Guest Shadrack has been gardening intensively for over 35 years and claims that her favorite plant is "whatever is in bloom". She belongs to many plant organizations and helped to establish the Buffalo Area Daylily Society. 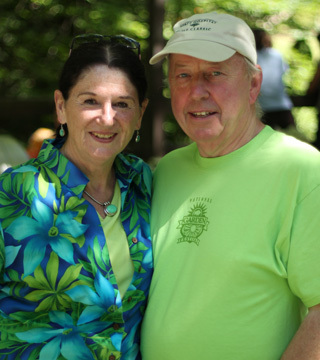 She is a former Board member of the Buffalo and Erie County Botanical Gardens, and the The American Hosta Society. Kathy serves on the board of the Western New York Hosta Society, and volunteers for Garden Walk Buffalo Niagara. Kathy, has always been interested in everything that grows although her main passion is for sun loving perennials, such as Iris and Daylilies, and spring time ephemerals. Her most recent interest are the polygonatums, or Solomon Seals, of which she now has a large collection. Kathy has always said that she is not a hosta person, she 'Married into Hostas' but she recently wrote The Book of Little Hostas that was published in November 2010 by Timber Press. Mike again provided all the illustrations. This book is designed to introduce gardeners to the joys of growing the small, very small and miniature hostas and includes details of over 200 beautiful little hostas together with ideas for planting them in the landscape and in various containers and troughs. In addition to writing The Book of Little Hostas, Kathy has been published in Fine Gardening Magazine and Upstate Gardeners' Journal as well as many smaller newsletters and publications. Mike and Kathy open their garden at Smug Creek most Thursdays and Fridays in July.